Art Greenspon, who was then 26-years old, had traveled to Vietnam and was promptly hired as an AP stringer. While stationed with American 101st Airborne Division near Hue he captured this picture of man with his hands raised directing a medical evacuation helicopter to remove wounded men of A Company, 101st Airborne. The Ashau Valley near Hue, Vietnam was a one of the main through fares of the Ho Chi Ming Trail, a supply line that provided weapons and supplies to the Vietcong fighting Western backed forces in South Vietnam. As such South Vietnamese forces often backed by American units frequently patrolled the valley seeking to stop the flow of war material. 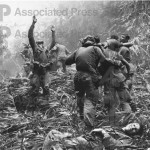 During one such American 5-day patrol a firefight between communist fighters and the 101st Airborne troops resulted in a number of wounded. While covering the evac Art Greenspon took this picture. When the image was sent back to the States and hit the wire famed photographer Douglas Duncan proclaimed that it was a “masterpiece” and the best picture of the war yet. While covering the war, on May 5, 1968, later a bullet passed through a LIFE photographer’s hand before hitting Greenspon between the eyes. He returned to New York to recover from the shoot. A few days later during this battle Tim Lickness, from the 502nd Infantry Regiment, 101st Airborne Division was handling medical evacuations. After a helo was hit by enemy fire and crashed he organized a rescue mission to get the surviving crew members. 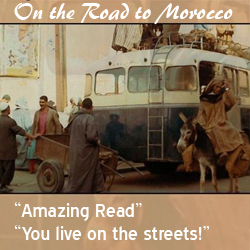 As he did participate in medical evacuations after April 1st, he might be one of the people in this picture. Movie Director Oliver Stone created one of the most iconic Vietnam War movies, Platoon . A veteran of the war himself Oliver Stone struggled to recreate his experiences in Vietnam. 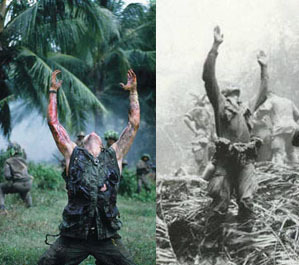 He was inspired by Greenspon’s image and created a memorable scene where Willem Dafoe’s character, Elias Barnes, is hit by enemy fire and throws his hands in the air, Christ like, as he collapses in death. 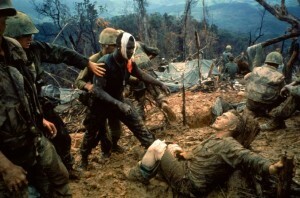 David Parsons a professor of the University of New York describes Stone’s effort of replicating this scene as trying to change the image of the American GI from aggressor to victim of the Vietnam War. 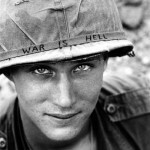 As the immediate politics of the war waned in the 1980s, American popular culture began to explore its human costs in different terms, most often locating the war’s tragedy in the experiences and suffering of American combat troops. 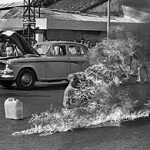 In this version of the Vietnam War narrative, Americans themselves become posed (both literally and metaphorically) as victims, helpless to even comprehend the scope of the tragedy that has befallen them.